Sincere thanks to Father Liam Cummins, for celebrating Masses in our parish this weekend. Fr Liam is a member of St Joseph's Missionary Society, popularly known as the Mill Hill Missionaries. MHM are an international fellowship of Catholic missionaries dedicated to announcing the Good News of Jesus Christ to people throughout the world. parishioners of the work carried out by APF – Mill Hill and to ask for continuing prayers and financial support, which can be given through their “Red Boxes”. 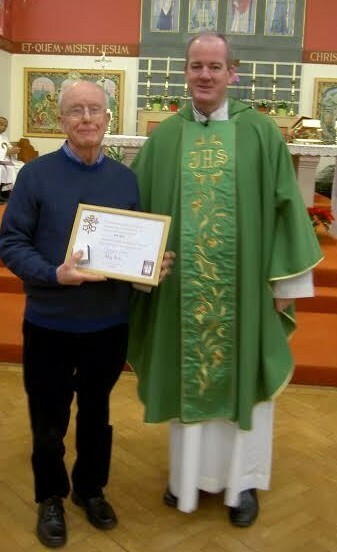 Father Liam Presented John Lyons with a medal and certificate for all the work he has put in, over the last 20 years, as our parish secretary for the Mill Hill Missionaries. His untiring work has meant that the amount collected by this parish for MISSIO, St. Joseph's Missionary Society, has always been well above average in the diocese. Most hearty congratulations and thanks to John, and his wife Linda, who no doubt helps count all the pennies at the end of the year when the Red Boxes are emptied. Anyone who wishes to obtain a red box to save their lose change for the Mill Hill missionaries, please make enquiries c/o John Lyons at the parish. Please subscribe to our newsletter for up to date information and news within the parish and local community.